Isn't today special being 11-11-11? I have a friend who's getting married on this day. Maybe somebody's going to win the lottery or something big. Are you doing anything special today? I am. It's my first time to demo a craft product today. 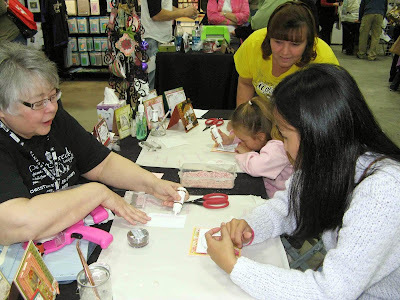 And what makes it extra something is that I'm doing it for Our Daily Bread Designs during the Deer Widows Weekend Scrapbook & Stamping Show by Great Scrapbook Events. I remember last year, I was on the other side of the table doing the make-and-take for ODBD. But it doesn't end there, as I will be taking three classes by Susan Pickering Rothamel of USArtQuest at the Marco's Paper booth. It is definitely going to be a very crafty weekend! If you're from Michigan and can make it to the Deer Widows Weekend Scrapbook & Stamping Show this weekend, please stop by the Our Daily Bread Designs Booth and say hi. I'll be posting photos all day Friday and Saturday at the Tinker Planet Facebook Page. 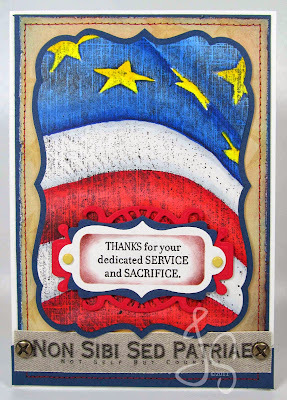 It's my first time to use this flag image by Our Daily Bread Designs (colored with Copic markers) and I love it! 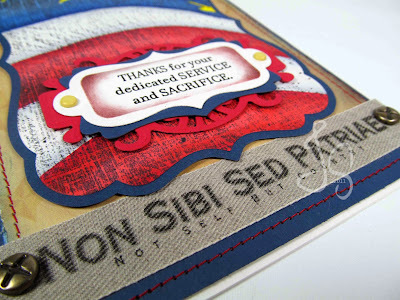 The sentiment from Stampin' Up works really well with what I what to depict in the card. I am very proud of my DH for dedicating more than half of his life to serve our country, together with dear family members, relatives and friends who did and are doing the same. I salute all the men and women in the military, past and present for all their sacrifices in keeping and defending our freedom. May the government NOT put all of this aside and modify and/or take away what military servicemen, past and present, deserve. Awesome!! Hope you had fun!! Your card is really awesome and it sure shows all it should, and you´ve done a wonderful coloring too. It´s really great. In Denmark this date is really popular and just in our nearby city 19 couples were married 11 o´clock, and in Copenhagen they said, there was 71 couples married this day and of them there was also 19, who got married exactly 11:11, so there´s been quite a few, who believes this brings lots of happines too. My own daughter was married on August 8th 2008, but the vicar wouldn´t marry them at 8AM, so it was in the afternoon as usual thoug. Have a lot of fun on the stall all week-end hun.